So the conservative pundits are walking back their overheated attacks on Judge Sotomayor, from Newt Gingrich eating his tweets to Rush Limbaugh announcing he may even back her nomination. But all the theatrics are obscuring a larger problem for the GOP: The fabled conservative media echo chamber, it turns out, is too successful. For years, independent experts and strategists in both parties all agreed that conservative media was a crucial part of the Republican Party’s resurgence. Talk radio mobilized the base, with Rush Limbaugh wielding influence that rivaled most GOP senators. Fox News framed national debates and turned party talking points into conventional wisdom. It worked so well, Democrats pined for their own echo chamber, plowing money into think tanks and political media efforts to imitate the GOP model. The message machine that helped put Republicans in power, however, now looks like an albatross for the opposition party. Let’s take a step back. There has not been a single hearing on Sotomayor’s nomination, but Senate Republicans are already playing defense over the party’s response to the nomination. But who speaks for the Republican Party? As every politico knows, the GOP’s Supreme Court vision was hijacked by Limbaugh and Gingrich, two of the most visible pundits atop the conservative media machine. While the Republicans who wield actual power in this process – U.S. Senators and especially judiciary committee members – have to angle for a single TV appearance, Gingrich holds court with his paid platform on Fox. (Rush also dropped by there Wednesday). Gingrich amplifies his views with an online regiment that is downright millennial in its scope — including "Second Life." His instantly infamous "Latina woman racist" tweet dominated several news cycles, and his blog post recanting it topped all online political news Wednesday, (according to the news aggregator Memeorandum).And now Limbaugh is backtracking as only he can, volunteering that he might support Sotomayor after all — but he still thinks she is a racist. Apparently racism is not a disqualifying judicial quality for him. All the fireworks, of course, are good for buzz and ratings. They were also good for keeping opponents off balance, for a time, when the conservative media’s adjoining political party controlled government. The incentives for niche political programming, however, run counter to the needs of a political party trying to crawl from 40 Senate seats to a winning national coalition. Republican officials are learning that in the minority, their echo chamber still works, but it’s working against them. 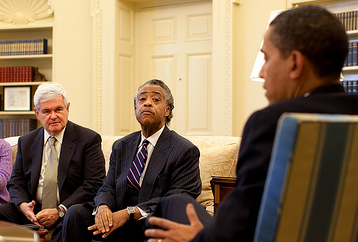 Photo: Gingrich meets with President Obama and Rev. Sharpton in the Oval Office in May. Credit: White House Flickr Feed.